Jim Henson has been an influence in my life for as long as I can remember. From Sesame Street to the Muppet Show, he has continually featured monsters in a variety of strange and bizarre skits. Absurd humor permeates the Muppet world, both geared towards the children that adore the characters, as well as the adults who watch with their children. Monsters, quirky humor, what more could a guy like me want from entertainment? Having recently stumbled upon the Muppet Wiki, I was pleased to find that sasquatches have infiltrated the world of the Muppets in a number of other ways. Take for example the Muppet comic book appearance of a sasquatch engaging in hand-to-hand combat with Miss Piggy. While the battle rages, Sam the Eagle is in the foreground ranting about how folks are gullible, using the belief in sasquatches as an example. Issue #4 has the 'squatch. On Sesame Street, a character named "Big Foot" appeared in the Elmo's World segment called "Feet." Big Foot is basically a large human foot. In the character's own words, it's a foot long (not 12 inches). 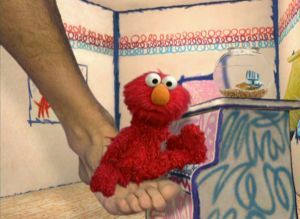 At the end of the episode, Big Foot helps Elmo play piano with his feet. Big Foot and Elmo jam on the piano.